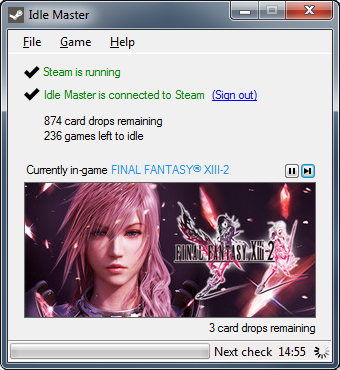 Idle Master is an application that automatically idles your Steam games to extract all of your available Steam Trading Cards. The application automatically finds the games you have drops remaining in, and idles those games one by one until all of your trading cards are in your inventory. This way, you can start up the program and go to sleep / work / away and come back to an inventory full of cards. Look below, download and run the setup.exe file there. The program should launch automatically when the installation is complete. Make sure Steam is open and you're logged in. To start idling, you'll need to click the (Sign In) button and sign in to Steam. Once that's done you should be "in-game" on Steam and the program will indicate as such. Now go watch TV, go to bed, or go on vacation. When you come back to your computer, you should have a pile of Trading Cards in your inventory. First of all, the program will determine which of your games still have card drops remaining. It will go through each application and simulate you being “in-game” so that cards will drop. It will check periodically to see if the game you’re idling has card drops remaining. When only one drop remains, it will start checking more frequently. When the game you’re idling has no more cards, it’ll move on to the next game. When no more cards are available, the program will exit. Do I need to download a game in order for this program to get it's trading cards? Do I need to be logged in to Steam for Idle Master to work? Yes, Steam needs to be running and you must be logged in. Does this work if my Steam isn’t in English? This new version should work irregardless of your Steam language. If you're interested in localizing Idle Master into your language, please let me know. Can I play a game while this is running? It’s possible, but doing so may significantly reduce your card drop rate. For best results, pause idling or exit this program before playing a game. Simply click the red X at the top of the application window. Presumably so, yes. People have been idling their games ever since Steam Trading Cards were introduced, and I'm not aware of a single person who has been punished for using these methods. Why do I need to sign in to Steam from the application? The entire project is open source, which includes the source code for all binaries. can i play a steam game while i idle another one using this program?